Amazon is the most powerful online retailer in the world. Although books are just part of their business model, they dominant the literary sector. Around 70% of e-book sales in the United States happen on Amazon.com. Every title in the store has a “Best Sellers Rank” (also called Sales Rank) reflecting how well it’s selling relative to the millions of books in the Amazon store. Beyond these basic principles, there is little certainty. 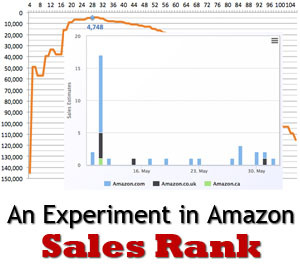 The basic formula for Amazon Bestseller Rank seems to be sales over time, meaning that a book must continue to sell to maintain a high position on the lists. In theory, it might therefore be possible to achieve a high ranking if a book sold a modest number of copies in a short amount of time. I decided to test that theory with an experiment. I’d already bought the e-book for both of my Kindles, so Amazon wouldn’t let me. 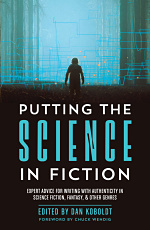 I didn’t want to appear to be gaming the system, or “buying the bestseller list” as is common practice in the business nonfiction world. Instead, I turned to friends and fans, most of them fellow authors, who were willing to help. More than 50 people stepped up, and agreed to purchase the Kindle e-book at a specified time on that day. We targeted 8:00 a.m., which meant that some who live overseas bought at around midnight, NYC time (morning for them). How long does it take for Sales Rank to reflect new sales? What rank could be reached with 50+ sales in a single day? What’s the effect on subcategory rankings? The first boost (2 hours) came from sales the day before, when some eager volunteers pulled the trigger a bit early. The two main peaks occur at hour 7 (European volunteers) and hour 16 (US volunteers). Thus, the lag isn’t quite 12 hours as I previously believed, but closer to 8 hours. It might surprise some that so many sales only propelled my book to #5,000, but this speaks to the size of the Amazon bookstore. If we assume it ranks 1 million books (an underestimate), this ranking is in the top 0.5%. 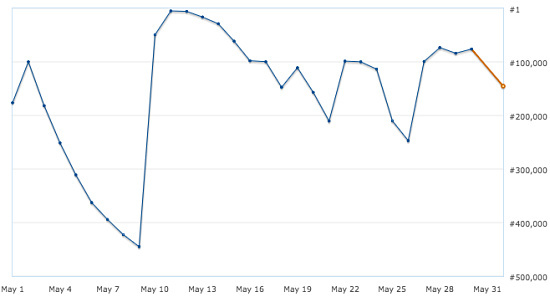 Notice another property of Amazon Sales Rank: increases happen quickly (as “jumps”), whereas the post-sale decrease in rank happens more slowly. Especially for the first couple of days. After 72 hours, however, the drop-off becomes more precipitous. This seems to support something I’ve read about Amazon’s internal ranking algorithm: sales from previous days carry some weight. The window seems to be 48-72 hours. Thus, even though the two Time Travel categories seem redundant (and arguably not appropriate for my book, but that’s another story), the non-Kindle category offers a competitive advantage. Presumably, that’s because five other books were selling better, but are only available as e-books. I’m disappointed, but not entirely surprised, not to have reached a higher ranking in Technothrillers. It’s a supremely competitive category dominated (currently) by the likes of A.G. Riddle. My book might arguably be categorized as Epic Fantasy instead, but that’s even more cutthroat in the Amazon store. Bottom line, I hit the top 50 in all three subcategories and top 30 in two of them. Although I’m happy to have gained a bit of discoverability, I won’t be making any bestseller claims in my Twitter profile. The huge peak from my sales-spike experiment is obvious, and does seem to have a tailing effect. However, just four days after that massive spike, my book returns to baseline (around 100k). 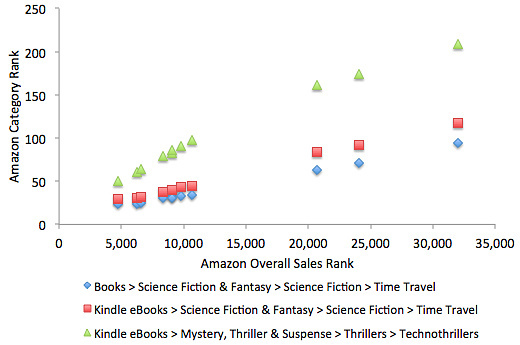 Amazon Best Seller Rank is a dynamic and fickle beast. The lag time between sales and ranking is around 8 hours. The Sales Rank benefit from a major spike carries over 1-2 days. 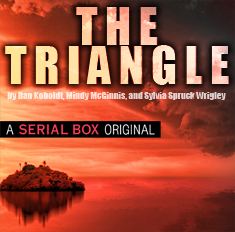 50 sales in a single day can propel a book to #5,000 in the Kindle Store. It’s possible to reach good category ranks (top 30) with such a strategy. Dan, I recommended this article to ThePassiveVoice.com and they featured it. Hope it drives some traffic to your books. Interesting results! Thanks for analyzing! 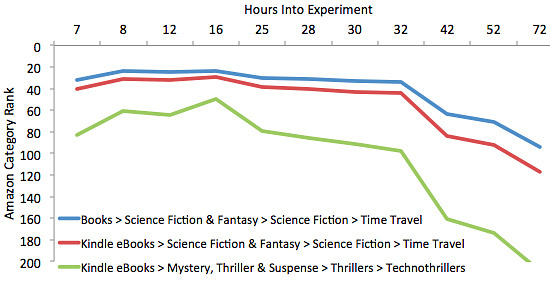 This is a fantastic experiment, and well explained. Pre-release behaviour on Amazon also suggests that sales ranking is not just sales based, but that page traffic is also an important factor. Thanks for sharing, Dan. This more or less confirms my suspicions. Loved the line about numerical torture…so true. Thanks for sharing, Dan. Very interesting stuff, indeed! Good job. 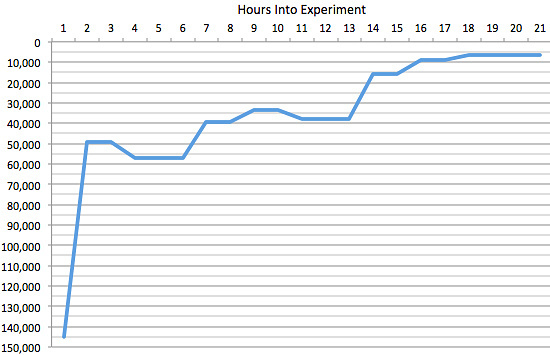 I think a big takeaway from this experiment is to really take the time to build a good mailing list. When you have that in place, you can definitely get some great sales and even create your own halo effect. BTW, I’m curious if you received any reviews and if so how many of the fans you enlisted for help reviewed your book? Palessa, I couldn’t agree more about the importance of building a mailing list. It’s probably too soon to tell about the impact on reviews, but I’m hoping some of the volunteers will leave them. Some of the comments in that thread quote much hugher numbers. Thanks, Dan, for an interesting and informative investigation. I’ve experienced the sales spike and decline several times, but your article gave me some context to understand it all better. Knowledge is power! A rule of thumb I have heard and subscribe to is that you can estimate the number of Amazon sales you’ve had in the past day by dividing 100,000 by your Amazon Sales Rank. I have found it to be roughly true for both print and e-books, though it supposedly doesn’t work well for the top 100 or so best sellers. Based on this rule of thumb, your book should have briefly been in the top 2,000. 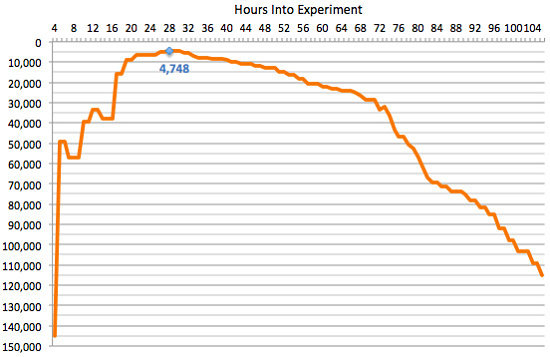 But if you combine the theory of 100,000 with the 48-to-72-hour theory, the #4748 rank isn’t surprising. In fact, your experiment demonstrated that there’s a lag in the rankings and that sales, or lack of sales, from the previous day or so do carry some weight. So if the book had sold 57 copies per day for three straight days it would have presumably cracked the top 2000. Thanks, Dan! Love the data. One question: how did the intervention affect your book’s sales? Would you post a follow-up one and two months out letting us know if you see any long-term bump? Inquiring minds want to know! Several years ago I managed to find a book on the mating habits of some obscure species of African fly or somesuch (seriously!) and it had a ranking down around 14,000,000, so Loyd’s information appears accurate. ranked at a cozy 3,800 in the mathematical aspects of paleontology and 16,103,478 overall! My first book, Dissecting Antismokers’ Brains, was self-published in 2003. Despite a total disaster befalling my main marketing plan (Basically I got screwed by a then-new Homeland Security rule about packages over a pound and a politically hostile small town postal manager who evidently sent ALL of my carefully prepared hundred copies of pre-pub review mailings off to a dead-letter office somewhere. :/) it still managed to sell about 2,000 in its first couple of years. During that time it remained largely under the 50,000 sales rank mark, sometimes briefly going up in the single-digit thousands. In more recent years, with Azon sales going down to one to five per month, it’s often moved into the two million + range. Initial rank dropoffs from one to five sales or so are steep nowadays: going from a brief upsurge of about 80,000 down to 1,000,000 within just a week or so and then to 2,000,000+ if it’s been several weeks since someone has bought a copy. There was one point this past winter when it flirted with 3,000,000 when close to two months went by without a sale. I sell a fair number through personal and internet contacts, but the bulk of sales are of course through Azon. And at one point I watched a similar “best seller” (HAH!) that was ranked at 11,534,329 drop down to 11,750,000 in eight weeks. My guess is that the curve is roughly hyperbolic for slow sellers: heavy weighting given to ANY individual sale, but with the dropoff curve deeply dependent upon long background sales history. Thank you for this post! I’d been wondering about the lag time for a while.